Soft, Fluffy and sweetened with honey, these homemade Blueberry Oatmeal Yogurt Muffins are to die for. Both little ones and adults love these muffins. You'll love the hint of orange and the yogurt makes them irresistibly moist and fluffy. Place rolled oats into a food processor or blender and process until flour like consistency is reached, about 1-2 mins. Place into a medium sized mixing bowl. Sift all dry ingredients into oat flour and stir well. In a separate medium sized bowl add all wet ingredients and stir well. Carefully fold in dry ingredients to wet and stir until just incorporated. 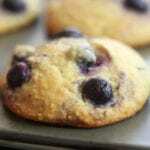 Fold in blueberries (reserving 2 tbsp for topping muffins). Add muffin liners to muffin pan. Using 1/2 cup measuring cup divided batter evenly among cups, filling to the top. Bake for 28-33 mins or until toothpick inserted in center comes out clean. Let cool for 5 mins before removing from pan. Cool to room temperature before storing. If making mini muffins, spray a mini muffin pan with nonstick spray. Fill each muffin cup with approximately 1 heaping tablespoon, filling to the top. Bake in a 350℉ oven for 16-18 mins or until a tooth pick inserted into center comes out clean. Yields 28-32 mini muffins. There are approximately 96 calories in 1 mini muffin.